I have a total of 25 pages of notes from the two days that Ramiro Ibañez was doing the butling at Surtopia. It was not just interesting, it was fascinating. Will take me a good while to write them all up but no time like the present etc. Wine #1 was Socaire 2014, a 100% palomino by Primitivo Collantes that I have been after for a while (in fact my first bottles were delived the same afternoon I went to dinner). 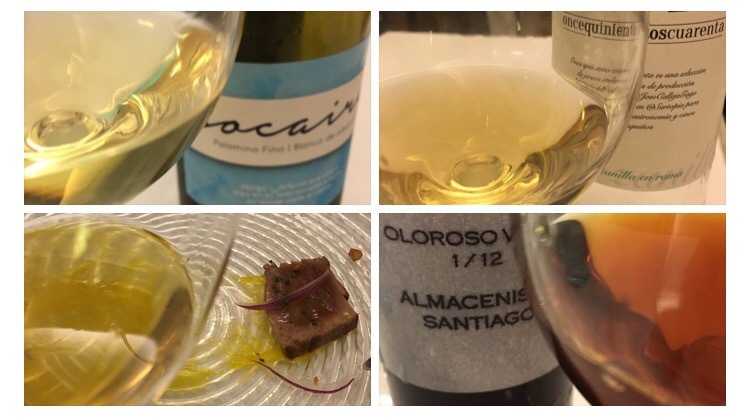 100% palomino from Finca Matalian, it is unfortified and has not spent time under flor but was fermented and aged for two years in botas that had formerly held Fino Arroyuelo. They were two years very well spent. The result is a beautiful dark gold colour and has a fantastic, lush nose that is blanc des blancs champagne first up, and gets more and more herbal – sweet herbs like rosemary or oregano – as it opens up. On the palate it is chalky and slightly saline without being zingy – austere minerals like a chablis. Long rather than wide, but wider than its little brother the Viña Matalian and a really interesting wine. Wine #2 was the new edition of the 11540 Manzanilla. Whereas previous editions were selected from Barbadillo’s Solear, this fella is from legendary Sanlucar bodega Sanchez Ayala – from 1/46 of the original Gabriela Oro solera to be precise. Sanchez Ayala has been a happy hunting ground for exclusive bottlings in the past and the wines have a high acetaldehide style that is extremely attractive (and fashionable). This one has an average age of about five years and has been through 7 classes. It is a shade darker than the Socaire, a dark straw colour, and has a massive nose of hay bales, salty brine, roasted apples and spices. On the palate it is zingy, salty, with a suggestion of that baked apple but then a long, nutty finish. Really excellent again. 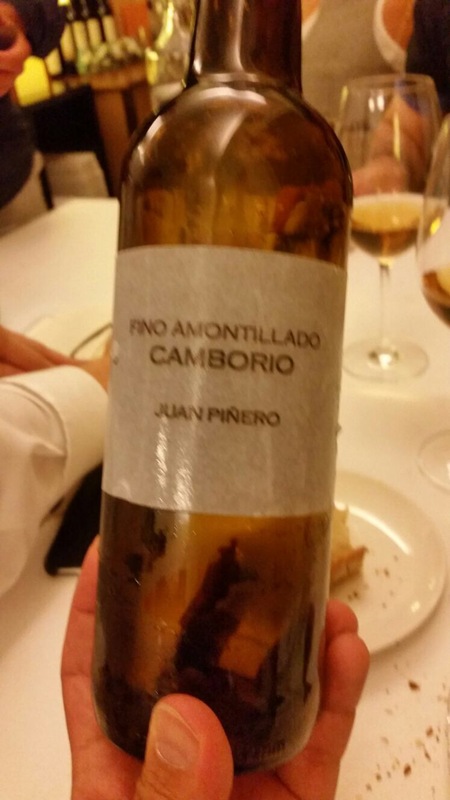 Wine #3 was the wine of the night for me: a Fino Amontillado Camborio. 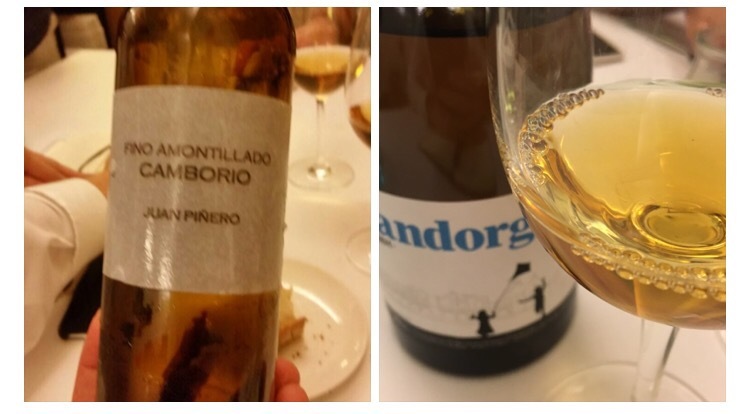 Fino from the legendary Camborio solera with those 10/11 years of biological ageing and that mineral structure that has been given a year of oxidation and has gained in character. Again a big acetaldehide profile of green apple over the sea air minerals of the fino but also touches of lemon on the nose. On the palate there is a suggestion of that green apple, then spices and herbs and a long, mouthwatering bitter almond finish. Really rich in feel and flavour but elegant too. Really superb. 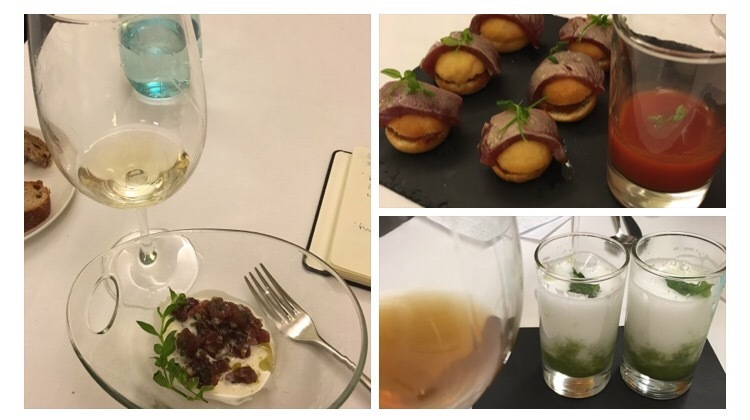 Wine #4 was the only wine of the night that I had tried before – the Pandorga 2014, the stunning fruit bomb pedro ximenez from la Panesa vineyard in Carrascal de Jerez. After a relatively cool growing season the grapes and 11 days of asoleo before fermentation in bota without any kind of temperature control. Fermentation lasted six weeks producing a wine that is 12º, has 270g of sugar, and more importantly has bags of fruit flavours and aromas including olives, apricots and orange marmalade. A delicious expression of year, terroir and fruit that has already become a classic. Wine #5 was the “big dog” of the night, an old old Oloroso 1/12 from Almacenista Santiago. Really powerful, rustic, old school almacenista oloroso. It is a dark reddish brown in colour, with a cigar box woody nose and a really powerful, bitter palate. Real acidity and concentration and although it didn’t have any noticeable juicy sweetness neither was it astringent or dusty. Good salinity too but not over powering. No doubt about it: a fighting wine. And that, as they say, was that for the first night (but not for my notes thereof – the remaining five pages of increasingly illiterate scrawl need much more work and reflection). Five really unique wines and a privilege to have been there.